This week, I made a heartbreaking journey back to Kenya to say goodbye to Sudan, the world's LAST male northern white rhino alive on the planet. Today, I am launching a print sale with a choice of two images, this one of one of the final moments of Sudan and an image of Fatu, Sudan's granddaughter and one of the last two surviving female northern white rhino on the savannah. I am donating 100% of the profits to support Ol Pejeta so that they can continue on their mission of protecting and fighting for some of the world's most vulnerable creatures. Sudan lived a long and good life and he was surrounded by love, with the people who committed their lives to protecting him. This image of Fatu, Sudan's granddaughter and one the last two remaining northern white rhino on the savannah, is also available in the print sale. 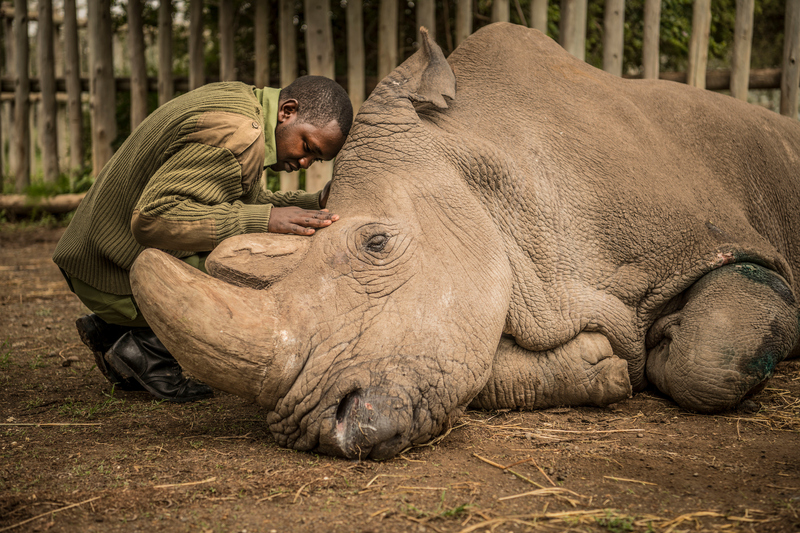 Sudan’s death could mean the extinction of his species, but if there is meaning in Sudan’s passing, it’s that all hope is not lost. This can be our wake-up call. In a world of more than 7 billion people, we must see ourselves as part of the landscape. Our fate is linked to the fate of animals. I had the privilege of meeting Sudan nine years ago, and he changed the trajectory of my work. When I heard about a plan to airlift four of the world’s last northern white rhinos from the Dvůr Králové Zoo in the Czech Republic to Kenya, it sounded like a storyline for a Disney film of captive animals returning to the wild dusty plains. In reality, it was a desperate, last-ditch effort to save a species. At the time, there were only eight of these rhinos left, all living in captivity. He looked ancient, part of a species that has lived on this planet for millions of years, yet could not survive mankind. I remember so clearly when Sudan first set foot on the African soil. The skies darkened and torrential rains came moments after we arrived. He put his head in the air to smell the rains and immediately rolled around on the ground. It was his first mud bath since he left the continent, taken from Sudan, the country with which he shares his name. That Sudan was moved to the Dvůr Králové Zoo may have saved his life; the last known wild rhinos were poached on the border of the Democratic Republic of the Congo in 2004. The image of Joseph Wachira saying goodbye to Sudan is the first image available in the fundraising print sale. View the other sale image available of Fatu, one of the last two remaining female northern white rhino on the savannah, here. The signed print is available for $300. The print ships free within the US. It will be printed by the fine art studio of Paper & Ink at 12×14 inches (30.5×36 cm) on archival paper which is designed to meet museum longevity requirements. Also available in 16×24 inches and 20×30 inches print sizes. Another way you can help protect and preserve wildlife is by visiting Ol Pejeta or many of the conservancies in Northern Kenya, like those in the Northern Rangelands Trust, and around the world, like the Dvůr Králové Zoo, where tourism dollars go right back into the communities protecting wildlife. Managed and properly controlled, tourism can be used as an effective tool to protect species and raise awareness about the natural world. Thank you and please consider sharing this sale.